last weekend i finally checked out the new Spice Station in Montreal's mile end neighbourhood, right next door to one of my favourite local shops, Arterie Boutique & Friperie (how can i not love it? we do, afterall, share the same artful name!). 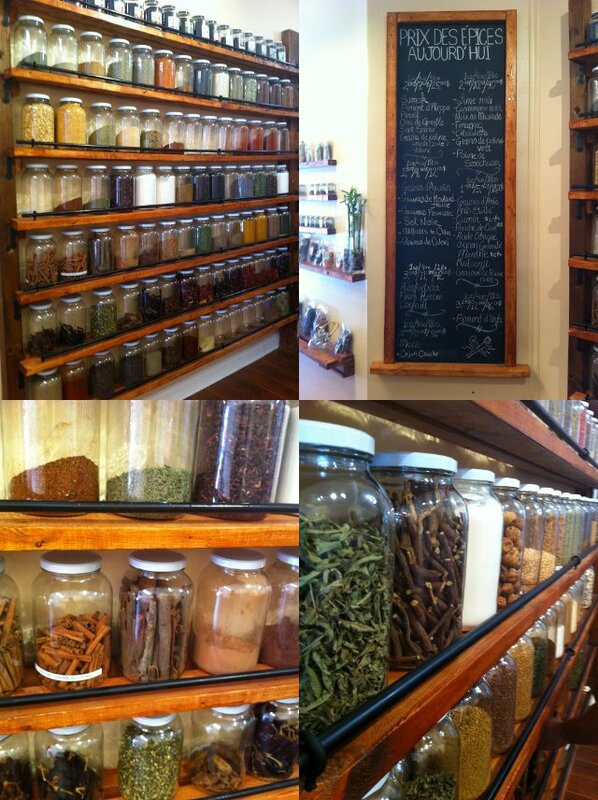 the gourmet shop, which originated in Silver Lake, California, offers a stunning array of carefully selected and blended herbs, spices, chiles, salts, sugars, and teas from around the world, displayed in large apothecary jars on floor-to-ceiling shelves made from relcaimed wood. warm and inviting, the mix of colours, textures, and aromas tantalizes the senses and opens up a world of possibilities. i came home with only a small selection based primarily on what we were preparing for dinner: whole pink peppercorns, first friday fish blend (a fish seasoning made with organic dill pollen), cinnamon sugar, and sherwood forest herbal tea. but i am eager to try some of their chiles (there were so many to choose from! ), whole black lime, harissa blend, himalayan pink salt, bali coconut lime salt, french lavender, sassafras leaves (used to make root beer), cinnamon saigon, raspberry sugar, and bourbon vanilla rooibos bush tea, among so many others. or how about this cooking with Julia quintessential french spice and herb set? it would make a wonderful gift, but is also a great way to get your Julia on! sigh, i think i'm in culinary heaven. and if i've wet your appetite, you can order almost any of these and other delights from the Spice Station website.